Blewu Casshius was 21 at the time of his surgery in 2003. 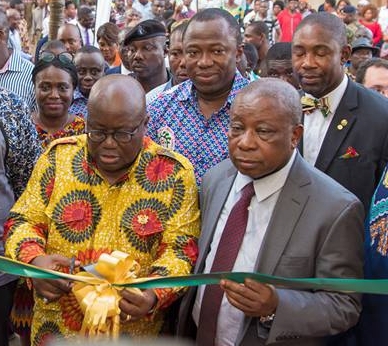 He worked with his father as a farmer in an area near Accra where the leprosy related and poorly understood Buruli Ulcer tropical disease is endemic. The bacteria which causes Buruli probably entered his leg through a miniscule wound and caused devastating injury which progressed through his whole leg. He was admitted to the RPSB Unit late in the development of the disease and remained there for 1 year despairing of ever recovering. There is no cure for Buruli, the only effective treatment to try to save Blewu’s leg and his life, was to surgically remove the lesions. In his case the damage was severe and had spread far and deeply into the underlying tissue. 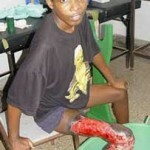 The Buruli ulcer was actively necrotising the flesh in his leg, the thigh was thin and wasted. Sadly, despite the surgery and Blewu’s enormous bravery through treatment, the Buruli had spread too far through his leg and it eventually had to be amputated. With earlier intervention his leg could in all likelihood have been saved. 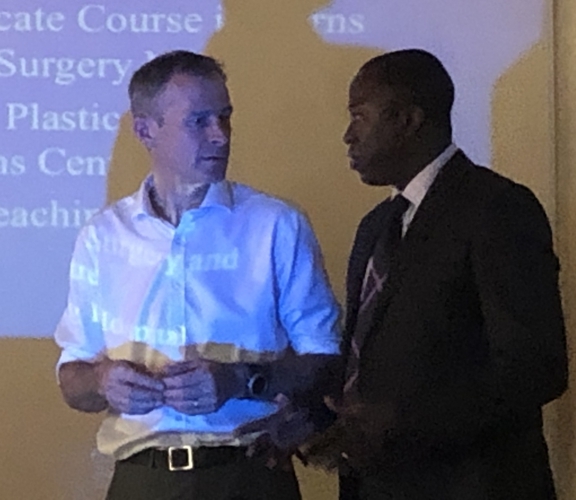 The RPSB is actively involved in a Ghana wide programme raising awareness of Buruli ulcer and the need for early intervention to successfully combat the problems that it can cause. 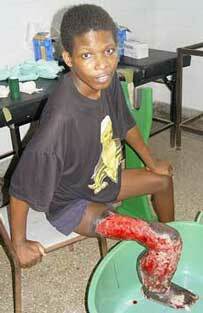 Blewu underwent agonising treatment as staff at the Unit tried to save his leg. He suffered excruciating dressing changes every three days as the raw surfaces were tended and rebandaged.